When you pursue adoption – at least domestically – part of the process is filling out an enormous form saying what kind of a child you will consider. That seems like kind of a stark way to say that, but honestly it’s a stark part of the process. Will you consider a child that wets the bed? Will you consider a child with a history of abuse? What about a child that was exposed to illegal drugs in utero? What about a child where literally nothing is known about family history? We were using a private agency and were almost certain to get an infant, so a lot of the questions were moot. (For instance, I fully expected a newborn to wet the bed. I was not disappointed.) But filling out that form involved a lot of soul-searching. It felt cruel to check NO for any of the boxes – after all, each of those boxes represents a child, at least in theory, who needs love. But I truly believed (and still do believe) that it was necessary to be honest with myself and the agency about what was realistic. I had to say no to some things, because I just didn’t think I could handle them. So we always knew that we might have children that don’t look like we do. With Levi, we got one who could fly under the radar. With Elias? Not so much. 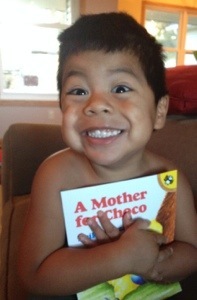 A Mother for Choco is a paperback children’s book about a little yellow bird with no mother. He’s looking desperately for a mother who looks just like him, but he can’t find one anywhere. He finally finds a mama bear who looks nothing like him but behaves just like a mother should, with hugs and kisses and love and silliness. When he goes home, he meets his new siblings: a crocodile, a hippo, and a pig. It’s a pretty great little book – a lot better than that synopsis – and he loves it. Especially the parts where we do the actions along with the story and hug extra tight. I know this isn’t going to be the last time we talk about how Elias looks different than the rest of us. It’s going to come up for Levi eventually, too. Even though his skin color is pretty close to mine, some of his features are different than you’d expect from a biological child of ours, if you were thinking about that sort of thing. And I know that the discussion is going to get deeper and more complicated as they grow up and ask harder questions. But I hope that both our boys will always understand, deeply and unthinkingly and at the very core of their souls, the lesson that Choco learned. That families are sometimes identified by biology and eye color and that weird crooked third toe that all the girls have. But not always. And that the most important components of families are commitment and time and sacrifice and humor, all stuck together with the immutable mortar of love. Thank you for writing all this! We have a special variety in our family too. Going to check out Choco on amazon! This book sounds like a perfect addition to our growing library. Oh, sister, my heart’s being broken over and over around here. 1. Lost Boy. By Jennifer Wells. Kobo purchase, though you can read it on The Star’s website, if you want, in one sitting. It’s the story of a bike messenger who died on our anniversary in 2009, killed by the car driven by the ex-Attorney General of Ontario. It was a road rage incident. And a miscarriage of justice. But the big thing that keeps coming back is the adoptive dad, Allan Sheppard, who knew his son’s weaknesses and loved him, past the point of no-return, even now, 7 years after his death. In the play we saw last night, the son, who speaks after death, and seems to be heard by the dad, says some things that just make me cry every time I think of them. Complicated story, and I hope you’ve got room in your heart for it sometime. (I had written to you about the dad before.) The central action of the play is a TV interview, in which the interviewer is broken down and becomes involved with the dad’s grieving and his story. I took my kids to the memorial last night, thinking it’d be about a half-hour of something innocuous. It was a full-blown tragic drama reading, and we hadn’t had supper. Oy.